A true marvel of magic! A spectator’s signed coin is placed under a handkerchief and then held by the spectator. The magician then removes a golden container from his pocket and it is placed in the spectator’s other hand. Now, with the handkerchief covering the signed coin in one hand, and the gold container in the other hand, the spectator is ready to be amazed! Professional Coin Vanishing Cloth Included! SS Adams Co in the 1930’s produced a metal & wooden set of “Nested Boxes.”In the 1950’s SS Adams Co mass produced their “Nested Boxes”in plastic; as seen referenced in the book "'Life of The Party’ - A Visual History of The SS Adams Company Makers of Pranks & Magic For 100 Years”by Kirk Demarais. 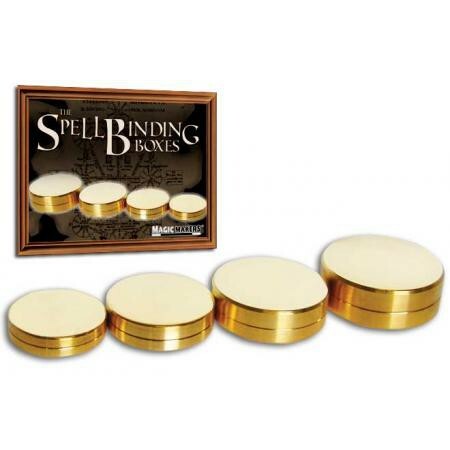 Magic Makers owns the rights to this amazing SS Adams Co effect and produces it in highly polished metal finishes and it comes with a professional coin vanishing hankie to make the effect complete and ready to use with no skill required..